… I’m measuring the lux above the LED which gives me a number proportional to the total lumen output of the LED. I guess you measure the lux at exactly 1 meter of distance right front in mule mode, then multiply that by some constant assuming lambertian emitter and whatever whatevers LoL. Could you elaborate a bit more? Thanks. Is there a high cri version of sst-40, like the 95 cri sst20? Not to be known available. 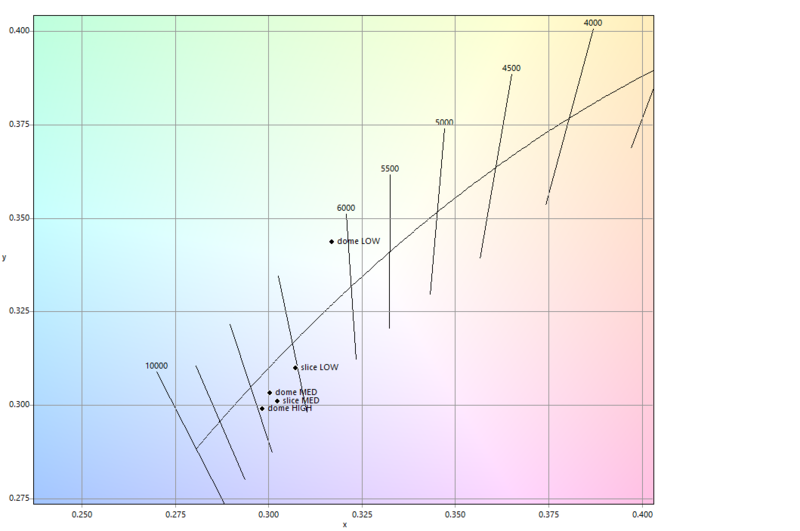 There’s NW tints vaguely referenced here on BLF, but if you go to their website here: https://www.luminus.com/products/white, there’s only 6500K and above listed, and CRI is listed as 70 typical. But here at Mouser they list 5000K and 5700K: https://www.mouser.com/Search/Refine?Keyword=sst-40. The weird thing is the “WDS” in the part # is not referenced in the datasheet, so these new 5000K and 5700K aren’t really covered in a datasheet from Luminus. It takes qty 500 min and 5 weeks delivery to get NW but looks like CRI is still 70. To clarify the #‘s, the SST-40 N5 BC VH bin referenced above is, I assume, is the BC bin, which according to the data sheet is 6500K? Does anyone know if there is high cri version of the sst40 led? says one 70 CRI on page 7 - "WCS", where S is for standard 70 CRI. Least this is today of what we know. The SST-20's fill the high CRI niche for now. 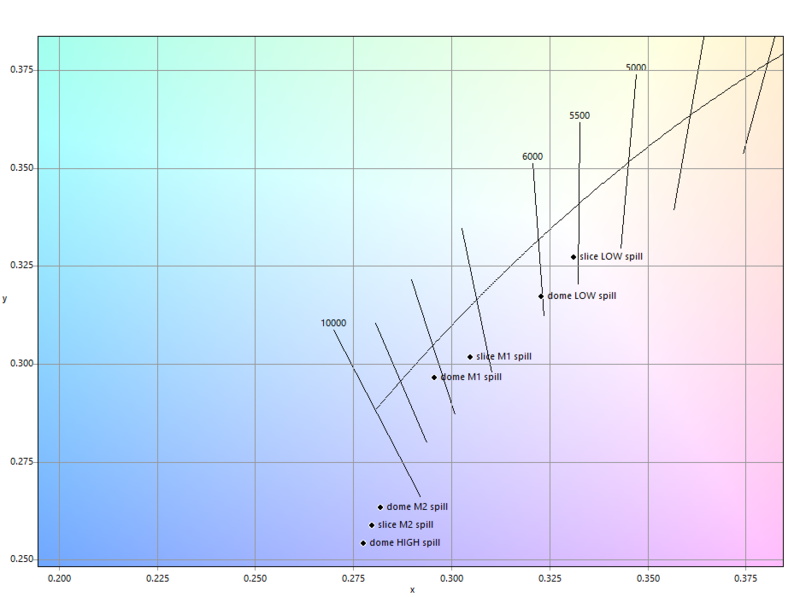 Basically high CRI means lower output - that's how it seems to be working now. What's new in the last couple years is we can get NW tints in high output bins, but the high CRI kills the output. Going to re-post this to this thread as a reference since I took the time to do it. This is two unverified bin SST40’s in two different lights (D80 and Enogear EC21, basically Nightwatch NS22). Both were sold to me as 6500K which I suspect is accurate. I did this to clarify to myself and others what to expect with a slice vs dome on LED and to predict what an SST40 5000K might do with dome on/off, assuming it behaves similarly. In my opinion the 6500K+ with dome on makes my eyes go if I look at the spill. It’s awful and basically unusable. The hotspot is generally very intense and far away so it matters slightly less and is probably passable if you need the output. After slicing, the shift is still noticeable but much better in the spill. The spill becomes more faint so the shift is less bothersome and the hotspot is so intense its hard to notice much difference there. TL;DR de-dome these at high output or use another LED. The 5000K will probably be better but still have huge shifts. Probably no need to worry about it going too “warm” after dedome. Seems unlikely at any decent current.